Three weeks going! I’m already beating the odds I gave myself in my description of this project. Let’s get right to it! We’ve got some nice, spicy takes here this week. This probably isn’t technically a Silly Take, but given that it exists at the intersection of Silly Internet Things, Political Nonsense, and Internet Tough Guy Posturing, I think it’s well within the #STOW ambit. Ted Cruz in turn responded with an Anchorman gif (”Boy, that escalated quickly!”) and that should probably have been it. Now, a part of me hopes that this is Mr. Marchman being deliberately ridiculous in order to take the heat off of a woman (Ms. Feinberg, who drafted the original call for pictures) who was undoubtedly getting a disproportionate and awful amount of hate from Dudes on the Internet, who are, let there be no mistake, The Worst. If that’s the case, then good work, Mr. Marchman, and I apologize. But I just want to revel for a moment in the gloriousness of “Unsurprising that not one Ted Cruz-supporting cuck/Twitter user is willing to face me in the UFC octagon.” I don’t know if I could find a better way to distill the silliness that is Internet Tough Guy Posturing into <140 characters. If Marchman is being ironic, then I admire his precision. My guess is that he’s not being ironic, given that 100% of the 11 tweets on his twitter feed consist of him whining about this dustup and two contextless RTs of weird things Curt Schilling once said. 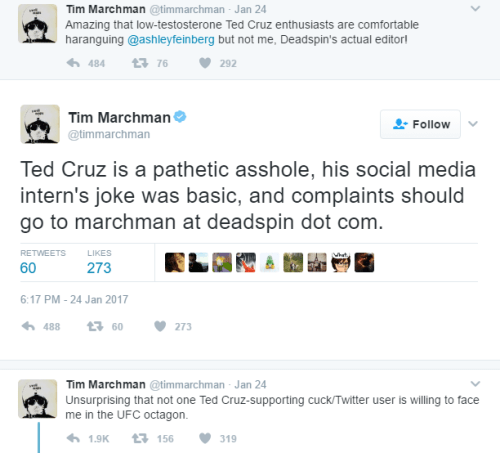 Also, as always happens with Internet Tough Guy Posturing, and as several right-wing websites were happy to point out, some people who are apparently Actual Soldiers And/Or UFC Fighters and who like Ted Cruz have offered to take Marchman up on his challenge. Don’t engage in Internet Tough Guy Posturing, folks. You look silly, and there’s always somebody out there who is bigger than you are and willing to call your bluff. David French, “This Is What Post-Christian Dissent Looks Like,” National Review,1/27/2017. I’ve tried to reread this a few times to figure out the connections French wants to make between protests and whatever the hell “post-Christian dissent” is, but all I can get out of this piece is a long, wet raspberry noise. So, in conclusion: shut up, David. See also George Will, “Trump and academia actually have a lot in common,” The Washington Post, 1/27/2017. I’m not willing to suggest that this whole article is really a Silly Take – its thesis is that the development of ultrasound technology was a useful tool for pro-life advocates and lawmakers, particularly in the context of those condescending laws that require doctors to show women ultrasounds of their fetuses before they have an abortion. There may well be some value in this train of thought, and I certainly learned some things reading this article. It’s not every day that an article for The Atlantic manages to mix up “born-again” Christians with Roman Catholics, misstate facts about fetal development, and get royally confused about who the governor of Ohio is. A little bit of fact-checking goes a long way, folks. Taylor Swift mostly doesn’t have public political opinions, and Amy Zimmerman has gotten weirdly mad about this before for The Daily Beast. I think about Taylor Swift about as often as I think about throw pillows – they seem nice enough, and some people seem to have surprisingly strong opinions about them, but I can’t see a lot of need for them in my life. But for Amy Zimmerman, the fact that Taylor Swift hasn’t taken a public position on Donald Trump is a Big Problem that must be Written About At Length. And look, this doesn’t matter, but Tom Hiddleston didn’t play Thor. Snark about anodyne celebrities looks even more petty if you can’t be bothered to get basic facts right. Filip Bondy, “How Vital Are Women? This Town Found Out as They Left to March,” The New York Times, 1/22/2017. Here’s the pitch: Filip Bondy wants to show that women are important. This is a good thing: women are important. these husbands had to take care of their kids for twelve full hours while the women went away to march for some weird chick thing. Can you imagine? Really goes to show how important women are. a fair and equitable bargain. Mr. Coyle is truly a just sovereign over his household. Maybe, just maybe, if you’re trying to write an article about how women are cool and neat and important and Trump is bad, don’t manage to make it sound like men having to stay with their kids for a Saturday is some kind of Great, Heroic Sacrifice. Thanks for reading! And thanks to Braden, Amanda, Tim, and Joel for submitting Silly Takes. As always, don’t forget to send your favorite ridiculous takes to sillytakes@gmail.com, and have a great week!